Your students will love exploring tessellations in geometry, and have a good understanding of tessellations after this fun and creative activity. A good example of a tessellation is a tile floor that is made of of shapes that all fit together with no overlapping and no gaps. Another example of a tessallation is a jigsaw puzzle. All the pieces fit together with no overlapping and no gaps. The one you see there on the right is what we call a regular tessellation is. A regular tessellation is made from a shape whose ides are all the same size. 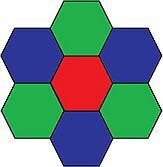 Take a look at the figure here and you can see that the tessellation is made up of hexagons (six-sided polygon) with each side the same size. Now for a cool tessellation math project activity your students will love. Why are they gonna love it? It gives them a chance to use their creativity and mix art and math at the same time. Ok., so here we go. I've listed the steps below the video, but watch the video first to see how it's done. First, help your students understand what we mean by an equilateral triangle. Because that's the first thing they will draw. Step 1. Construct an equilateral triangle on your construction paper. Step 2. On one side of the equilateral triangle you constructed, make any kind of design making sure to start from one side and end at the other side of the triangle. Watch the video to see this. Step 3. Cut out this new shape and then trace it onto another piece of construction paper. Step 4. Rotate the new figure making sure to match up the two sides of the triangle.